Dorothy Jane Mills holds a bat and her own Seymour medal at her home in Naples, Fla. New York Times photo. 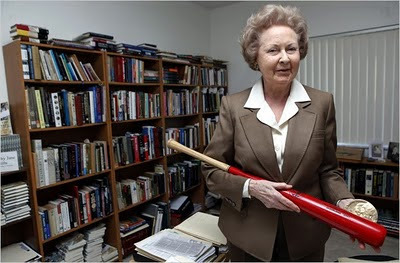 On Sunday, the New York Times published a fine article by the baseball writer Alan Schwartz in which baseball historian Dorothy Jane Mills (formerly Seymour) is credited for her work on three important books. Back in 1996, when she lived in British Columbia, I profiled her for the Province newspaper, an early acknowledgement of her important contributions to our understanding of baseball history. The article was reprinted by the Edmonton Journal, the Winnipeg Free Press, and the Kingston (Ont.) Whig-Standard. Dorothy Mills, who has never played an inning of baseball in her life, probably belongs in the Hall of Fame. She has spent much of her life in windowless rooms reading yellowed newspaper clippings, sifting the ashes of baseball's forgotten history, seeking larger truths in the minutiae of the summer game. Her late husband, Harold Seymour, was the author of three noted volumes of baseball history, a trilogy that is to baseball historians what the Dead Sea Scrolls are to Bible scholars. Only now, four years after Seymour's death, is she willing to take credit for her contribution, which includes most of the research and much of the writing. "After he passed away, that was my opportunity to point out that I was deeply involved," she says today. That is not a minor confession. Their trailblazing work made the study of baseball a respectable one, inspiring untold college courses and uncountable volumes of baseball history. Their pioneering efforts also made possible the filming of Baseball, the 18 1/2-hour documentary by Ken Burns for which Mills was a consultant. Last weekend, the inaugural Seymour Medal, honoring her and her late husband, was presented in Kansas City to author David Zang for his biography of Moses Fleetwood Walker, a 19th-century black player. Yet she admits she'd "probably drop the ball if anyone ever threw one at me," and confesses she has no favorite team, no hero of the diamond. Truth be told, she does not much care for the game. "I am not a ball fan," she says. "I'm not a games person. No games excite me, really." These days, she winters in Naples, Fla., and summers in Sidney at a tidy trailer park favored by seniors, a development sandwiched between the Victoria airport and the ferry traffic on Highway 17. Her contributions to baseball research are now limited to an online chat group, although she is quick to respond with a letter when she spots an error in a newspaper or magazine. As Cleveland State sophomore, back when the Indians won the World Series in 1948, she fell in love with a dour professor who maintained an uncharacteristically boyish enthusiasm for baseball. They married and she left the school to embark on a self-directed study of baseball, economics and America. She haunted archives and libraries in New York, Cleveland, Cincinnati, Chicago, St. Louis and Cooperstown, N.Y., mining a rich lode of documents. "I began to think of it as a treasure hunt," she says. "Each time I found something interesting it was a clue to something else." While baseball was a new-found interest for her, to her husband it was a lifelong obsession. Seymour was born in the Hell's Kitchen neighborhood of Manhattan, an area so tough his mother refused to let him play outside. The family moved to the Flatbush section of Brooklyn when Harold was six and he grew up within earshot of fabled Ebbets Field, home of the Dodgers. He found work at the park as a turnstile boy, scoreboard operator and, to his everlasting delight, as a bat boy, all the while dreaming of a major league career for himself. The closest he got was forming a semi-professional team at age 17. "He was a very strict manager," Mills said. "They called him McGraw," after the tyrannical John McGraw, manager of the New York Giants. The closest Seymour got to the majors was by bird-dogging as an unofficial scout for two clubs. While his pro ball career was left in the on-deck circle, he began to put up some good numbers in academia. Still, in the 1940s, his inaugural proposal to teach a course on baseball history was unanimously rejected by faculty. "At the time, it was not a respected field for serious research," said Tom Heitz, the former librarian of the Baseball Hall of Fame. "People laughed at him and belittled him for what he was doing." Some years later, Seymour was studying at Cornell University in Ithaca, N.Y., when he submitted a Ph.D. dissertation on the same topic. His thesis was accepted and, in 1957, he won national publicity for earning so high a degree for so low a subject. The couple recast the thesis into two volumes for Oxford University Press, the first of which -- Baseball: The Early Years -- was published in 1960. The second volume was called Baseball: The Golden Years. Both received standing ovations from critics and are still in print. Sports Illustrated magazine, comparing the author to a famous chronicler of the Roman Empire, called Seymour the "Edward Gibbon of baseball history." While Seymour had a well earned reputation as an imperious and taciturn man, his whimsy found expression in the naming of two New England homes in which he wrote his histories. The first was called Bush League Farm, the second Big League Camp. A third volume, Baseball: The People's Game, an account of the sport as played by amateurs, was published in 1990, most of it written by his wife as his conditioned degenerated. Seymour died of Alzheimer's disease at age 82 in 1992. A year ago this month, his widow made a pilgrimage to the Hall of Fame in Cooperstown, N.Y. She brought with her to the baseball shrine a box containing her husband's remains. On an unseasonably cool summer's evening, a handful of historians gathered in the grandstand above the red brick wall that is the backstop at Doubleday Field ("where Abner Doubleday did not invent baseball," Mills notes pointedly). A eulogy was read. Then, one historian stepped on to the dirt surrounding first base, shaking free a dusty ribbon of ash at the position where Harold had played as a boy. Dr. Alvin Hall, a professor from a nearby university, told the assembly that the scene reminded him of a classical dialogue not so much Platonic as vaudevillian. He said, "I'll never again be able to hear the famous Abbott and Costello baseball routine 'Who's on first?' without thinking, `I know who's on first."